Light is the second part of this two part story and continues with the Destiny making a beeline for the primary of the solar system the ship found itself in when it came out of FTL. Of course at this point they are not aware that this was a deliberate choice by the AI of the ship so faced with imminent death extreme measures need to be taken. The sensors pick up three planets in the solar system, the first two are not suitable for human life and the third is behind the sun and impossible to get accurate data on. However to reach the planet in good time the shuttle will have to leave before confirmation of suitability is obtained so the choice is bad to try to save 17 people. Colonel Young picks Scott and TJ to be on the shuttle as pilot and medic and the remaining 15 places are determined by a lottery, Young and Rush remove themselves from the draw. The shuttle departs with the chosen few and the remainder of the crew spend their last few hours, some read, some just walk and some take comfort in their faith or simple companionship. Time ticks by and the planet is scanned by the shuttle and proves to be unworthy for life and back on Destiny there seems to be some confusion as to why they are still alive. Rush figures it out and with a burst of joy (yes he smiles and laughs) takes in the wonder of the Destiny as is cruisers through the photosphere of the star and gathers in the energy rich plasma the ship needs to power her systems. The call the shuttle and order them to return home but they are unable to rendezvous with Destiny, Rush and Eli do some quick calculations and project a course for the shuttle around the planet building up speed and slinging them out of the system along the same path as the Destiny. Of course they make it back intact and all seems right with the world now they know the method Destiny has been using to power herself for these millennia but for Young the question of did Rush know or suspect this was the case…. 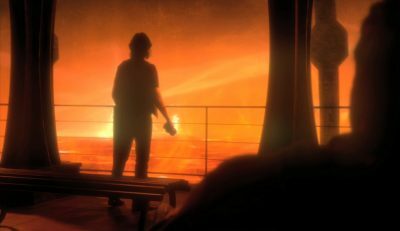 Light is another good episode of Stargate Universe and a worthy second part to this story which as we know was originally a single episode called “Fire”. It was great to see Rush smile and be rather civil to more of the people on board but at the end we get the conflict within the character come to the forefront, Rush is always going to be that chaos element in this show. This week podcast promo was for Treks In Scifi a very long running show which was mostly Star Trek specific but has branched out into all aspects of Scifi over the years. We also want to thank Thomas for the long recording session he put up with to record this and last weeks episode and he will return later in the season. Next week however we are going to be joined by Ian for the episode Water, we hope you just us for that and feel free to let us know what you think and spread the word on Stargate.